Best Diet Nutrition Guide - Paleo, vegan, low carb, or intermittent fasting... what’s the best diet? Find out now with this FREE nutrition guide. it can be tough to separate fact from fiction. The diet options are endless: Paleo, vegan, keto, low carb, fasting, and more. So how do you figure out what actually works… and what’s pure hype? Want to learn a proven way to choose the best diet for yourself or others? We’ve learned more about effective nutrition than anyone else. Now we’re going to teach you our secrets. 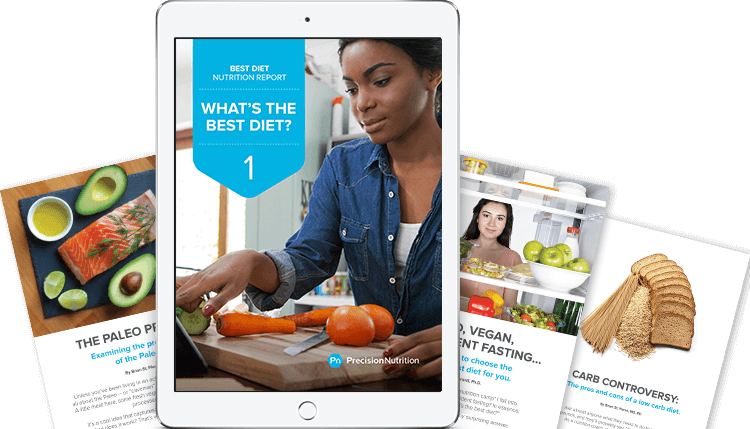 Sign up for this FREE "Best Diet"
How to evaluate and choose the best diet — for yourself or others. The risks & rewards of popular diets (paleo, keto, low-carb, high-protein, more). Our tested 3-step process for fixing a broken diet, no matter how broken. How to identify food intolerances and deal with common sensitivities. Our goal is to give you the knowledge and resources you need to confidently and successfully choose the best diet — for yourself or others. This nutrition guide is completely FREE. You’re one step away from getting our definitive guide for choosing the best diet. Simply enter your name and email and we’ll send it over right away. for continuing education credits with the following organizations, among others.